The Historic Centre of Urbino is remarkable for its legacy of Renaissance culture. It developed under the patronage of its duke, Federico da Montefeltro (1444-1482). His court attracted many scholars and artists, and was a leading example among European courts of that time. The Duke's Palace can be admired from afar. It is the landmark of this town and a pretty sight too. To reach it, it takes some climbing in the steep streets of Urbino. 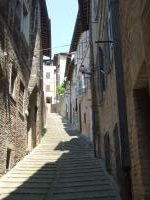 It's a pleasant walk however: Urbino is a university town, which gives it a lively atmosphere. There are plenty of cheap eateries in any case! So I arrived at the Duke's Palace, and found it partly hidden under covering. A sign said that reconstruction would finish in April 2009. Had I come in vain then? I almost retraced my steps, when I noticed a small sign pointing to an alternative entrance. The guard on the lookout took me straight through the museum and delivered me at the ticket window. So for 4 EUR I was to see it all anyway. The palace is huge, and every room has ornamented doors and fireplaces. The building now serves as the National Gallery. This museum must be an art student's dream. Room after room of valuable paintings from the 15th and 16th centuries. And statues and tapestries too. I gave it about an hour, and also sped through the megalomanous Duomo next door. 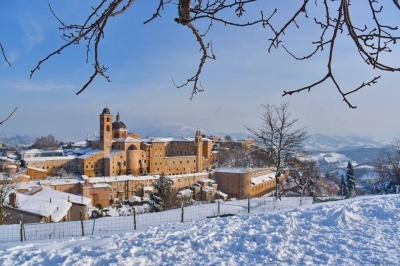 On the first week of March, the “Beast from the East” almost made me to cut Urbino from my plan after I heard that there was a weeklong heavy snow to this city causing many roads to be closed and some municipalities near Urbino declared emergency situation. After successfully secured rental car with winter tires, a hard to find in Italy and found out that clear sky would happened for only one day, I drove to Urbino directly from Rome in early morning. When I reached Urbino, the weather forecast was accurate, it was cold only -6 degree Celsius but with clear sky. The whole city was under the thick snow; however, the city was really lively by the locals who came out to use this one-day chance to clear snow from their home and moved their cars to underground parking which the city just announced to waive all parking fee, a good news for me. Unfortunately, because of heavy snow, all the attractions and most of the shops and restaurants were closed. Even it was closed, the ducal palace complex was really a main attraction for its sheer size compared to other places in town, the view of its front façade from the square in front of the city gate was classic postcard. From there I took an elevator to upper part of the city and aimlessly walked around the city along the streets that full with piles of snow and broken ice. I walked to the famous steep Via Raffaello, passed the closed Rafael House and end at Parco della Resistenza to see the beautiful city skyline from the park in front of Fortrezza di Albornoz. At first I wanted to walk back to lower part via Viale Rosselli, but the road was full with snow and not passable, so I had to walk back Via Raffaello. Along the way I decided to take a detour via smaller streets to see this historic town as much as I could. Finally, I found some café opened and decided to try local cuisine, Crescia, a kind of panini, and sampled some Casciotta cheese with local wine, a simple but great meal. I spent around 5 hours in Urbino until snow started to pour again and then I decided to leave the city before the weather became worsen. In my opinion, Urbino was a lovely old town of Italy, it had fine architecture and the city landscape was quite nice. It also had delicious local cuisine that I was really happy with. Despite the bad weather, I still enjoyed the visit quite a lot. It may not in the same league with other UNESCO World Heritage listed Renaissance cities in Central Italy like Florence and Siena, and has many similarities on urban landscape like Assisi or Pienza, but the city really has its own charm enough to be stand out and should not be missed out by any casual or World Heritage Site travelers. I visited this WHS in March 2012. 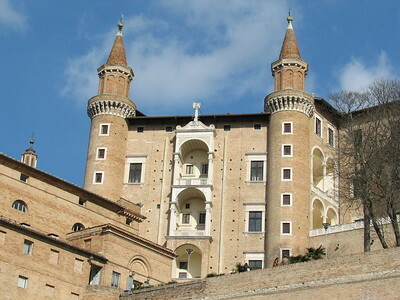 Urbino maintained its Renaissance appearance throughtout the centuries and offers a really authentic experience. This is the town of steep streets, one of the steepest being via Raffaello, named for the artist who was born in a house on its slopes. At the top of the street in a shady park I found him as a bronze statue. Besides the Ducal Palace and the Duomo the WHS includes a number of other palaces, notably Comunale, Odasi and Palma which I manged to find amongst the narrow streets. There is no railway station in Urbino, so I reached the town by bus from Pesaro station. Urbino is a pretty hill town in the Marches region, just a few kilometres inland from the Adriatic coast. It experienced a relatively short period of power in the 15th century, and has since been known as a treasure trove of the Renaissance. The main sight is the Ducal Palace, which today houses a museum of Renaissance art. This is a very nice attraction, but the rest of the town is not so different from many other Italian towns. I also saw the cathedral (rebuilt in the 19th century after an earthquake, and not really impressive from the inside) and tried to see Raphael's birthplace (closed for lunch break...). I recently returned from a 5 day stay in Urbino to visit with my daughter who is taking a summer course at the Univerity there. This was NOT enough time to explore this wonderful city. I stayed in a great hotel across the street from the Ducal Palace. (The San Domenico) It was an old convent that has been re-invented as a classy and beautiful hotel. Each day I'd walk the hilly streets while my daughter was in class. The gelato ofcourse was a wonderful way to combat the heat, and I was averaging 2 new flavors a day! At night we walked to the piazza and sat with the locals and tourists alike, drinking wine and having dinner at the outdoor cafes. We would sit on the church steps and marvel at where we were and how ancient those actual steps were. I still can't get over the old people walking the steep streets. There are a lot of young people ofcourse, and plenty of night clubs to visit. A good day trip is to take the bus right at the bottom of the city walls to Pesaro. The buses leave Urbino about once every hour. Pesaro is a beautiful beach town on the Adriatic Coast. From there you can catch a train to almost anywhere. The people in Urbino are so nice, and helpful. We had a great time and I recommend this little gem of a town to people who like the perfect mix of tourism and local flavor. This is one review I never thought I would write, enthusiastic as I am about this city, concerned that it maintain the atmosphere that I enjoyed so much during a four-day stay in 1996, and not eager to see it ovewhelmed with people who would not appreciate it, including the elegant and friendly bar I happened upon. The friend I was with and I agreed that we would tell no one about this place. I know you will understand. However, since it is on your site, I will say something about it. As long as I have known who Rafael of Urbino was, it did not dawn on me that this would be the same place, when I drove down from Ravenna to Pesaro (wonderful lunch there) and up to Urbino. It is the home of the invisible University, housed as it is in the existing monasteries and other church buildings from its magnificent past. I found Raphael's home, and could imagine the charmed life he must have lived there, the youth and adolescence he experienced until he attained something like adulthood, such a short adulthood. I had never known before what it would have been like to be an Italian aristocrat of the Renaissance. I know now. The chapel of San Giovanni contains one of the most striking and effective frescoes I have ever seen; called "curious" in Michelin, but much more than merely curious. That fresco is worth a trip to Italy. The chapel is on Via San Giovanni; there is a path from Via S.G. to the lower town with an unforgettable view of the Palazzo Ducale in the distance. The Palace of the Duke is something out of one's dreams of medieval fairytale; and the exquisite chapel will be a complete surprise to everyone who visits. One just does not expect such subtle taste and simplicity from someone as powerful as a Duke. Maybe it was his daughter's idea - if he had daughters. But the city is much more than this or that monument; it is a center of learning resting among the clouds, the thousands of students coming over from their residences in a neighboring hill-town to merge into the urban landscape of Urbino like so many beautiful children on holiday. Urbino is a haven for the wanderer, the stoller, the person who will not fail to look down and explore every alley along the way, from alleys with dead ends to alleys with miracles of beauty around the last corner. I never wanted to leave. This was home. I trod lightly, enjoying the fun of the place and the beautiful elegance of the place in awe and respect. It was the ultimate rest of any trip I have ever made, with all the fun and excitement of a university town. Unique, in all likelihood. Urbino is most of all a haven for peace. One afternoon I was resting in the room, getting ready everntually to go out for an evening stroll, and I sensed the aromas of the restaurant kitchen downstairs. It was the perfection of scent. I was looking out the window across the courtyard to the windows on the other side, and this exceptional treat for the nostrils entered the room. It was utterly peaceful, the only sound an occasional word or two from the kitchen. It was a perpetual Saturday afternoon with an exciting evening ahead. All of Urbino was waiting outside; all the elegant countryside waiting around this city on a hill; and above it the ranks of angels and others of their kind - should any of them exist, it is here that they would exist - and above that either the aether of the empyrean or - and it is fine by me - the genial spirit that built all of this. There are several pictures of the city at Leverdujour. Thank you for this site; I will enjoy exploring it very much.